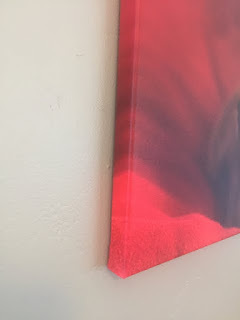 Canvas Press, Inc., a company that specializes in creating custom canvas prints for homes and offices, offered me a canvas print in exchange for a review on my blog. 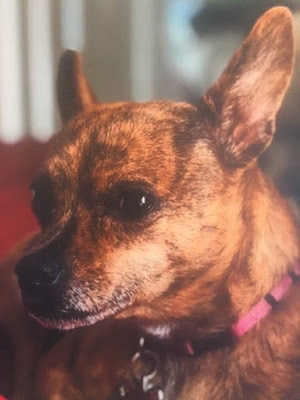 While I looked around the website, the pet photos especially caught my eye. 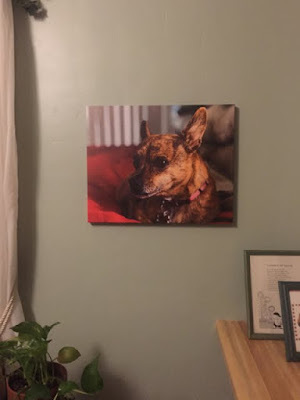 I love to decorate my home and thought it would be wonderful to have a large photo of our little dog, Daisy, a Chihuahua and terrier mix, in the den, where she spends a great deal of time. My idea was to order a canvas print of Daisy, but it was hard to find a really good picture of her. (I almost decided to submit a photo of a bowl of ramen, that I'd posted on Instagram; as many of you know, I post a lot of food pics on Instagram.) Luckily, my husband found a sharp picture that my daughter, Angela, had taken with her iPhone, a photo that captures Daisy's charm. It was easy to submit the photo to Canvas Press online, but I wanted to make sure that I'd cropped the photo properly, so after my order was confirmed I contacted customer service via email. I was quickly assured that the print would look great, but that I could make changes if I wanted to. I took their word for it, and in less than a week, my beautifully packaged, gorgeous 16" x 20" canvas print arrived. Once removed from the package, it was ready to hang on the wall. The colors are rich and vibrant, and this canvas print of Daisy is a wonderful addition to our den. It's truly a terrific, larger than life photo of her, made with great care and craftsmanship. The sides and edges are beautiful, as shown below. Many thanks to Canvas Press! I'm thrilled with my canvas print of Daisy, and will cherish it. Canvas Press offers canvas prints of various sizes, as well as photo paper prints, wall murals, and wallpaper. What would you order from Canvas Press? As always, your comments are welcomed and appreciated. Thanks for reading! What a beautiful photo of a beautiful dog. I would order a print of my dog and 2 cats. Vicki, your pets are so adorable--I could see a canvas print of Kaiyo and your cats! Thank you for stopping by! A picture (or pictures) of your cats would be wonderful. Thanks for leaving a comment, Mel! The picture looks great. I think that it is really a nice thing that people can now get this done with photographs. Daisy is a beautiful dog.. Thank you, Brian Joseph! This picture captures her spirit well. Great photo of Daisy in canvas! Nice review too! Thank you, Eriko! I love the canvas print. Impressive quality - and what a keepsake. Thanks for sharing! Mary, the quality is exceptional. This print's fine art. Thank you for stopping by! That is so cute! A great way to have a nice picture to hang up of your Daisy. I bet my Daisy puppy would appreciate it as well. I am so happy with it, Laura. Thanks for stopping by! A really sweet picture of Daisy that you can now enjoy for years to come. Thanks for sharing. Thank you for your comment, Diane. It came out really well. I've heard of Canva, glad to hear it turned out really nice. Such a cute picture! oh my gosh, how perfect, she looks so sweet! Canvas Press sounds like they do great work. It looks like Canvas Press did a great job. Your dog is adorable! Lovely canvas! Thanks for sharing your photos and info about Canvas Press.